One of the things that God used in my life as a young teenager (and brand new Christ-follower) was being given a copy of The Living Bible (a paraphrase of the Scriptures by Ken Taylor). It was the early 1970’s and the only Bible I had used up to that point was the old King James Version. For a Jr. High student who loved sports more than school – and a poor reader too – slogging through the KJV was tough for me to understand. Then I was given a copy of The Living Bible – and I began to read the book of Proverbs. Wow! 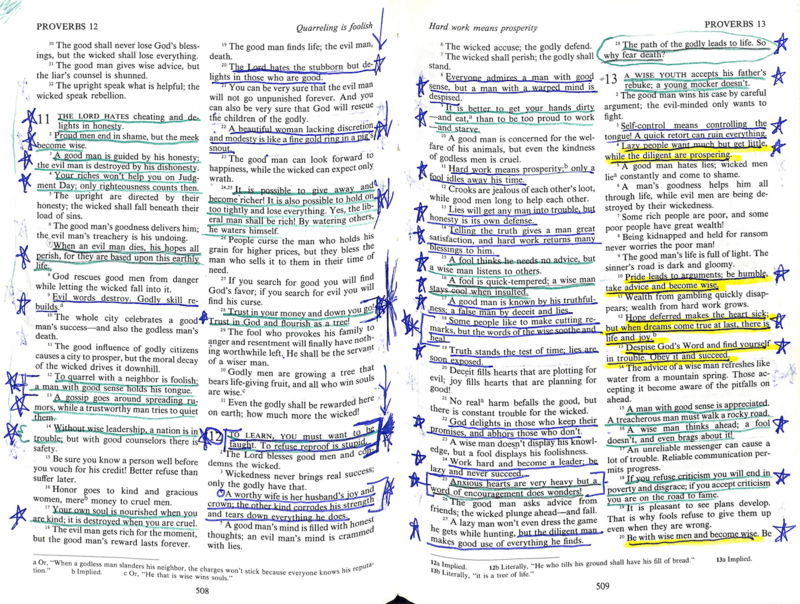 I began to underline and highlight verses – and Scripture came alive to me in a whole new way (then, on my 15th birthday, I received from my parents my much beloved NASB Bible that I still use to this day). I encourage young people – older Elementary age, Jr. High, High School & College age, in particular – to read the book of Proverbs regularly and take to heart the wisdom that is contained there. Recently I was skimming through my old copy of The Living Bible (pictured above) and I was reminded again of the verses that impacted me throughout my early teenage years. Here are a few verses from Proverbs that were very impactful for me (from Proverbs chapters 10-16). I would encourage everyone to consider reading through the book of Proverbs every month (one chapter each day – 12 times a year). It will allow this wisdom literature to sink deep within our hearts. And if you have young children (or grandchildren), consider sharing some of these proverbs with them.